Finally! A fixed publication date for New York Minute, 24 June, and the pre-order is live on all eBook platforms. Print will be live prior to pub date and the audio is being done this week and will be also be ready before pub date. I’m more excited about this title than anything in years. I wrote and rewrote this book from the heart. The characters are real to me—and that’s what this book is about: character. I was thinking about what I wanted to write in terms of thriller over a year ago as I’m going back to that genre after years in science fiction. I thought about a Jack Reacher type of character and story; especially given the parallels in Reacher’s fictional life and my real one: Reacher was West Point ’82, I was ’81. Reacher was in Lebanon during the bombing while my unit, 10th Special Forces was running the MTT there when that tragedy occurred. Reacher’s mother is French from Strasbourg; my wife’s mother is French from Strasbourg. I love Lee Child’s books, but as he says in the new opening to Killing Floor (a must read), Jack Reacher is a mythical character. A modern knight. I realized I couldn’t write such a character, perhaps because of my own flaws. I wanted to write someone like the special ops people I’ve known, warts and all, but with a deep moral code, who is forced, against his will, into making a decision that he swore never to make. I wanted to surround him with a cast of re-occurring characters, each with their own flaws, strengths and backstory, and, most importantly, secrets. There are characters in this book that will grow much deeper as the series goes on. I’ve rewritten this book more than any book I’ve ever written. And, by delaying publication, I was able to write most of the next book, Lawyers, Guns and Money and it will be published just 90 days later. By doing that, I was able to deepen the characters and go back to New York Minute and make adjustments. I already see the third book, Walk on the Wild Side as I know the exact image at the end of Lawyers that will propel Will Kane, the protagonist, into that story. I’m thrilled to move Will Kane forward in time from 1977. Not just in New York City, but as he gets involved in events such as the founding of Delta Force and Desert One. Honestly, another one of my goals is to break this book & series out long term as an indie author. I’ve successfully been publishing without the backing of a Big 5 publisher or Amazon for a number of years. In this day and age, the entrepreneur can make their own way as I have been doing for a long time. As such, I’m thankful to my readers for their continued support. I was giving a keynote at the Santa Barbara Writers Conference several years ago and I mentioned this book and movie and got blank stares. The book isn’t that great actually. It reads like a manifesto and lecturing. One of the few times the movie is better than the book. You’ve got Burt Lancaster and Kirk Douglas to start with. As antagonist and protagonist. President Kennedy actually allowed them to film the opening fight scene outside the White House, he was so impressed with the story. The movie was originally scheduled for a December 1963 release, but Burt Lancaster forced them to delay it as he felt it was too soon after the assassination. This was the second of Frankenheimer’s “paranoid” trilogy after The Manchurian Candidate. The mistress part, played by Ava Gardner, was based on General MacArthur and his long time mistress. When Kirk Douglas is entering the Pentagon those are real guards who had no clue who he was and saluted him because he was in costume as a Colonel. The Pentagon had refused to allow filming there which makes sense since its about a military coup. In the same way, my book, The Line (Shadow Warriors), which is about a military coup by a secret clique of West Pointers, was refused to be reviewed by the Academy’s graduate magazine or be racked in their bookstore. John Frankenheimer who directed it wanted a more futuristic weapon than the current M-14 in use in 1963. So he choose the Colt AR-15. Which subsequently was adopted by the military. Leonard Nimoy was in the casting call for the movie, but never appeared. My favorite scene in the movie is when Jiggs Casey, Douglas’s character, puts all these little clues together (no big smoking gun) and makes the career-ending decision to go to the President with his suspicions of a coup so quickly. 15 March is a significant date in history, but not just for the event of 44 BC. It’s also the date in 1917 that the last Tsar of Russia formally abdicated, which I submit might be the most significant event of the 20th Century, given what followed and is still happening. It’s also the date in 1783 that General George Washington, with the Revolution not over and peace negotiations dragging on in Paris had to make a famous speech at the encampment in Newburgh, NY, to quell a mutiny among his officers who had not been paid for a long time. He saved the fledgling United States even before it was a United States. Other events happened on this date and these three and others are part of The Ides of March (Time Patrol). Which is free all the time on all eBook platforms. It is a window into this series of books I’ve written where the basic premise is that there is a force from another Earth timeline that is trying to change ours by traveling to our past and changing events. The Time Patrol’s job is to keep our timeline intact. It’s not perfect, but we’re still here is the basis of their missions, especially since they’ve learned other timelines have had their history changed and utterly disappeared. How the Last Tsar, Nicholas, came to fall from power is a fascinating story and some powerful lessons can be drawn from it. I covered some of the major events leading to this as one of the seven disasters in Stuff Doesn’t Just Happen: The Gift of Failure. Which is free today only, 15 March. While we mourn today with New Zealand, we must mourn with all mankind and do our best to stop the hate. This might be the most significant event of the 20th Century. Tsarist Russia was gone, replaced by Communist Russia. Part of the momentum behind Hitler’s rise to power was the battle against communism in Germany. The Cold War. And on and on. To the present day. The reasons for the fall of Tsarist Russia are complex, but focusing mainly on Nicholas, I lay out the six Cascade Events that led to the seventh, the formal abdication in Stuff Doesn’t Happen: The Gift of Failure. It is currently free. I also used this event in another book, The Ides of March (Time Patrol) where I ran a mission to stop the Tsarina from halting the abdication and causing a different outcome. One of the premises of the series is that we need to keep our history the same based on the fact we still exist. Because the Time Patrol knows there are other timelines that had changes in history and they no longer exist. At 11:57 PM on 12 March 1928 and then cascading into 13 March, the St. Francis Dam, north of Los Angeles, failed. Designed by William Mulholland, the man who was hailed for bringing water to the City of Angels, there is another dam, designed exactly the same, still in existence in the city of LA. The slideshow below details the Cascades that led to this disaster and what we can learn from them. The book, Stuff Doesn’t Just Happen: The Gift of Failure 2, in which this is one of seven events covered, is free 3/12 to 3/15 here. This is the stuff I love finding when researching. in 1720, a Spanish expedition out of Santa Fe was attacked in Nebraska by Native Americans, most likely at the instigation of the French. The Spanish were there to capture French explorers and trappers and stop the French expansion west into what was ostensibly Spanish territory. The site of the battle, more a massacre, isn’t certain but most likely near Columbus, Nebraska, where the Platte River meets the Loupe. Spain had claimed ownership of the Great Plains since the Coronado Expedition of 1540-1542. Which is 180 years before this massacre. That’s a lot of time. I find the history of the west prior to what we normally view as “westward expansion” fascinating. The Spanish were led by Lieutenant General Pedro de Villasur. He had forty soldiers, sixty Pueblos, 12 Apaches and some others. They left Santa Fe and went north through Colorado, Kansas and into Nebraska. On 14 August 1720 they were attacked by Pawnee and Otoes, and if you look closely at the drawing on the buffalo robe, it looks like other Europeans, most likely some French. Most the Spaniards were killed. The survivors limped back to Santa Fe and that was was the end of Spanish attempts to take the fur trade from the part of the continent. The Hot Zone was a #1 bestseller when it came out in 1995. It also got me thinking. When we deployed overseas one of the things our team medics had to study and brief the rest of the team on was the medical threats in our area of operations. I was on my sixth Dave Riley novel and I decided to write about a pandemic being utilized as a weapon. Biological warfare has always been an indiscriminate weapon and therefore not popular with the military. That is, of course, changing. On our current horizon, we will see biological weapons designed for specific genomes. We’re talking genocide. Continuing my tradition of brilliant titles, I topped my five previous books with this one: Z.
Yep. That’s it. One letter. I mean, seriously? Why didn’t anyone smack me upside the head? I thought I was being cute. Big lesson here, writers! Don’t be cute. Be smart. Terrible, terrible title. 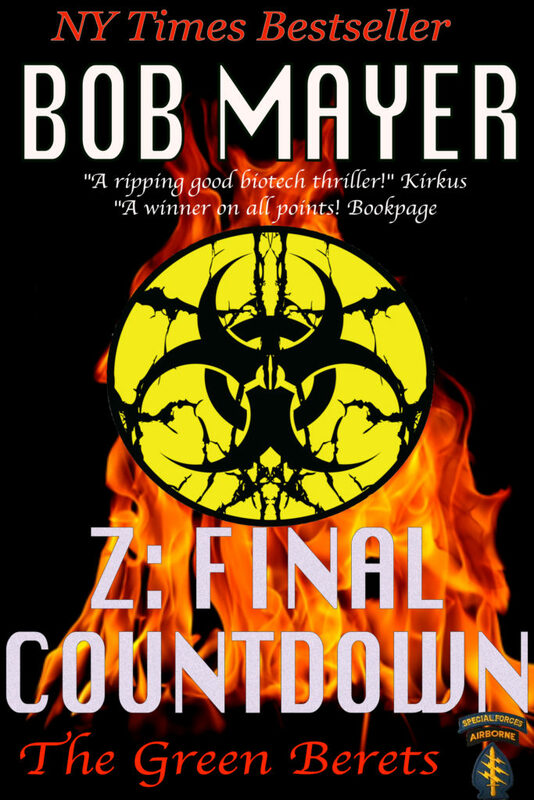 As you can see, since I’ve republished it, I’ve added Final Countdown to the title to give it a little pizzaz. At this point in my career I was doing one thing right, though. I was staying ahead of my contracts. Z was the third book on my second three book deal. But I was already thinking ahead. This is one reason why I’m still making a living as a writer after three decades– I stayed ahead. Any writer who thinks they have it made? Their career is over at that moment. My wife asked me the other day how many people have been making a living as a writer of fiction as long as me and the list is pretty short. That’s not boasting. That’s just a reality. So, I will soon talked about how I further went into the science fiction field with The Rock one of my favorite books. How Do You Stop An Imperial President? One of the duties of a fiction writer is to predict the future; and sometimes re imagine the past. The issue of a president bloated with power and breaking the law is a problem that has bedeviled our country throughout its existence. There are times when Presidents have pushed the limits of the law and even broken it. Sometimes for good, sometimes for bad. Sometimes for objectives that can be argued about, such as empire-building. After all, the Louisiana Purchase was completed by Jefferson by bending, if not breaking the law. Lincoln violated the law during the Civil War. The Mexican War, which U.S. Grant fought in and thought immoral, was almost solely for empire. I pondered this question a few years ago and then wrote a book on the premise that men such as Alexander Hamilton and Thomas Jefferson, coming from opposite ends of the political spectrum but also being intelligent, would see the potential problem. And come up with a solution. The solution was The Jefferson Allegiance. When this book came out, it ended up being a #2 national bestseller on Barnes and Noble, just behind The Help. Who Would You Want To Survive With? What special skills and background do you have? The people on your team? These include medical, construction, problem solving, military, the list is basically about coping with a mild emergency that isn’t life-threatening. The key is to know what you can and can’t do, and what those around you can and can’t do. Think back to the last emergency experienced—what was the reaction? The answer to this will give a heads up to how one will react in the next emergency. There is no right or wrong answer, but awareness helps. These skills include medical, military, gardening, hunting, survival training and experience, pilot, boat operation, camping, weapons, cooking, land navigation, swimming, communication (personal and technical) construction, problem solving, fire starting, knot tying, the list goes on and on. Under Mod/Ex we’ll talk about team building. Think back to the last crisis encountered. What was the instinctual reaction? Some people can react well others panic. This is a reality that has to be factored into any scenario. Mild: Evaluate & list the following for you and each member of your A-Team. This includes ability to walk, how much of a pack one could carry, physical disabilities, allergies, medical status, special needs, etc. Mild: Evaluate and list the following for you and each member of your A-Team. Able to drive? Access to a vehicles? By looking at these checklists you can see what assets and liabilities you and your A-Team have. From The Procrastinator’s Survival Guide. Since every idea has been done, a job of the writer is to absorb as much idea and story from the world around them. Not to plagiarize: it’s research. It’s our job. In the evening, my wife and I, and our dogs, pile into bed and watch TV. My wife always has the remote and she’s always right about what she chooses to watch. The range is eclectic. Sometimes I think she’s the only one who has found certain shows, like the time we watched a documentary on barges– which turned out to be a fascinating study on character. As you see, I easily digress. My wandering brain which is on the autism scale– my wife also made sure I got it tested a few years back because she was trying to figure me out. They used to call it Aspergers but now its high functioning. I think you pick up on that via these posts. Anyway. Back to Goodfellas. We watched that one night many years ago and the next day were discussing it. And one of us, probably her, wondered what if they simply got rid of people in the Witness Protection Program? That’s because most of them revert to a life of crime. And that was the heart of my fourth book, Cut Out. 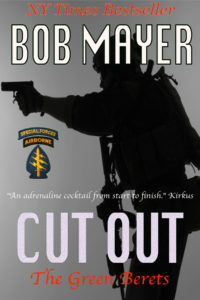 A somewhat better title than my first four, although I doubt many people know what a cut out is in covert operations: a person who knows both sides but both sides never meet or know the other? It’s a way of keeping both sides safe. This was the fourth book featuring Dave Riley, the protagonist I began with my earlier books. I just wrote Dave into a future book, New York Minute, which is set in 1977 when Dave is only 17 and getting ready to go into the Army and meets his older cousin, the protagonist of this new series, Will Kane, to ask about Special Forces. And once more I digress.